Pascal is the creative brainchild of the site www.paris-marais.com. I think it’s one of the best sites about Paris and has all the right elements - useful information, user friendly/simple to navigate, beautiful images, and most of all, tells you everything you ever wanted to know about the Marais. It was Pascal who gave me my first paid writing job. He sent me an email about three months after I started my blog in 2006,saying how much he liked my site and my writing. He asked me if I was interested in writing some articles for his site and I enthusiastically said yes. My first article was about men’s fashion shops in the Marais (It’s still posted on the site). We have been friends ever since and he has always been very supportive and helpful with promoting my tours and blog. Pascal started Paris Marais in March 2005. He saw there were no websites that promoted goods and services in the Marais, a neighborhood dense with history and culture, and that most other sites just skimmed the surface with a few common tourist sights. He thought he was more of an insider since he lived in the Marais for over 15 years, and better qualified than other writers who weren’t based in Paris. Pascal is very civic minded, especially in the gay community of Paris, and the official/unofficial gay area of Paris is the Marais. He saw an opportunity to promote gay tourism and again, saw something clearly missing in the marketplace, a site that had extensive information about gay Marais. Pascal was a successful copywriter and creative director for some top ad agencies in France, specializing in creating campaigns in the luxury and tourism industries. Clients included Air France, British Airways, and Club Med. His writing, marketing and promotional skills were a useful asset to start his business. His childhood was spent in the Pyrenees, Burgundy, French Alps and Monaco. He moved to Paris when he was 16, and spent two years in London before moving back to Paris. He discovered the Marais in the 1980’s when it was first becoming the gay district and was interested in the history and architecture. He moved to rue du Temple in 1987 and has remained in the area ever since. The comprehensive site is divided into 8 categories: Hotels Paris, Hotels Europe, Shopping Guide, Visit Le Marais, Going Out in Paris, Gay Paris, and Real Estate. Addresses are selected to promote the best in each category with the idea to have a complete marketplace/guide to the Marais as well as France and Europe’s hottest spots with information about everything from knowing where to get your morning croissant to buying a luxury apartment. 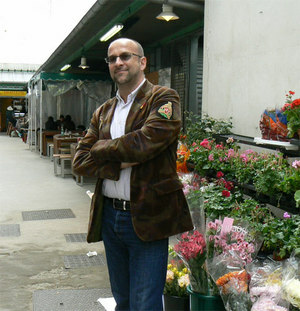 He is a top correspondent for the Paris tourist office and many travel guides and European newspapers. The site had over 800,000 unique visitors last year and 1,200,000 projected for 2008. His civic mindedness has paid off since he’s had the honor of having the mayor of the 3d arr., Pierre Aidenbaum, sign an editorial welcoming people to the site. Pascal is also a bit of local television star. He’s starred in 20 short films about the Marais for the Paris television station CAP 24. Ever the entrepreneur, Pascal is creating additional web pages containing more destinations and expanding into six languages including Russian. I wish him continued success in promoting my favorite and his neighborhood in Paris. I really enjoyed the history behind the Kir Royal, it's a drink I happen to love. Me too! However, cassis is BLACK currant, not red. Hello, first of all want to thank you for the great article and second but not least - can you tell us more about this "Eye Prefer Paris Tours"?! Will it be next year?